Factor of «power» and the threat of use of force have always been an integral part of history of humanity. According to scholars and historians over the last 5000 years there happened more than 14 thousand wars on our planet that have killed nearly 4 billion people. During the ХХth century mankind has gone through two major world wars, numerous revolutions, overthrow of colonial and socialist systems, as a result of political motives more than 170 million people have been killed. Modern scientific and expert community of political analysts, historians, specialists in international affairs, social analysts, conflictologists and researchers of other fields of social life comprehending these tragic processes proposed a number of diverse hypotheses, doctrines, theories and concepts that from different perspectives examine the issue of «power» in international relations and offer proactive strategies to resolve conflicts without use of power factor. Usually, the power of the state was identified first of all by its military might. For the first time the factor of «power» as a substantial category determining the behavior of states in the international arena was presented by a Greek philosopher Thucydides in his book «History of the Peloponnesian War» [‎1, p. 52]. In the ХХ century the basic concept formulating the phenomenon of «power» was given by an American researcher R.Dahl, who among the first modern researchers has defined the power as the ability of one of the actors of the international relations to force the other for certain behavior model, which the latter would not otherwise do without coercion [‎‎2, p. 203]. By definition of R.Dahl the concept of «power» should be considered through the behavior of international actors as a description of capacities of an actor of international relations and the ability of the latter to use the selected capacities to change the behavior model of other actors. In the opinion of W.Kaufmann, a scholar of Princeton University (USA), only a military power serves as a baseline for political prestige and economic authority of the state. «It can be argued that the power factor became a driving motive for implementation of foreign policy strategies of actors of international relations. It is difficult to imagine the development of international relations without the influence of military powers» - noted the American scholar [‎‎3, p. 242]. For H.Morgenthau, who is commonly accepted as the «patriarch» of American school of political realism, the force is first and foremost a tool of governing the world and power over the minds and actions of people. In his theory the scholar does not differentiate such concepts as force, might, power and influence, regarding them as synonymous while the main content of his research works can be represented in formula that «International politics, like all politics, is a struggle for power» [‎‎4, p. 97]. His colleague John Stossinger, an American political analyst, regards the category of power in international relations as the capacity of a state to use effectively its real resources and potential with the purpose to impact the lifestyle, system of values and behavior of other states [‎‎5, p. 27]. R.Cline, an American analyst, the author of a book «World Power Assessment», argues that power of international actors lies first of all in their capacity through involvement of tools of persuasion, coercion and open use of military force to persuade certain actor to take such political decision, which he otherwise would not adopt [‎‎7, p. 8]. In addition, a British philosopher B.Russel considers power as a method to get desired results [‎‎6, p. 25]. Consequently, on a common denominator of the mentioned definitions of category of «power» in international relations there is a unified baseline component, - «the capacity of the state with maximum benefit for its national interests to shape the behavior of another state or group of states against their will through the use of various forms of pressure or dependence». Theory of modern international relations identify several components of «power» in addition to other tools available to the state and serve as a driving force for implementation of national interests. Below we are going to look at the structural elements of the category of «power»: Military power of the state is characterized by the level and intensity of its military potential that effect the other state, group of states or system of international relations in general and the ability to ensure national and foreign policy interests of the state; Economic power of the state emerges through the degree and intensity of impact of economic might of an actor on certain states and the system of international relations in general. The key instrument of economic power is the export of capital, government external loans, foreign trade and embargo, etc. ; Energy power lies in the ability of an actor to ensure the sustainability of energy receipt in the amount needed to ensure vital critical needs of the state and economic well-being of the population; Political power is the ability of the state to influence on the behavior of other actors in the international arena through diplomatic settlements; Scientific and technical power is a scientific and technological progress and intellectual property rights on certain high-tech products. In particular, active development and mass production of latest gadgets strengthen the position of a state- producer on the world stage and form a system of dependence of state-consumers respectively; Information is power of the state, which is realized through the ability of an actor of interaction to reach the desired results in foreign affairs through persuasion, moral and psychological pressure using all available modern information and communication tools; Cultural and ideological power is expressed mainly within the state and has an external focus. Overview of ideological power of an actor is defined through the influence of dominant ideology, morale, system of values and lifestyle on other entities’ partnership. Although the effectiveness of such influence cannot be measured in terms of quantity, however the qualitative indicators have been reviewed in the pursuit of other states and social groups to follow the ideals from outside. However, at the present historical stage the scientific-theoretical interpretation of «power» notion has been further developed within the concept of «hard», «soft» and «smart power», this notion was pioneered by Joseph Nye. In this context under the notion of «hard power» the American scholar understands «the ability to use the principle of the «carrot and stick» approach». That has been acknowledged by military and economic might of the state with the aim to force certain countries to follow the desires and requirements of other actors of international relations» [‎‎8]. The scholar defines the «soft power» notion as a process when the actor of action expands the power and influence on other entities without coercion and pressure. First of all, the understanding of «soft power» notion is based on attractiveness of an actor. Thus, the researcher considers that foreign policy may be able to achieve the desired goals without the use of military force or economic sanctions, only through the influence of cultural, scientific, diplomatic and educational factors [‎‎9, p.34]. According to Joseph Nye’s definition «smart» power rests primarily on the ability to shape «hard» and «soft» power into an effective strategy [‎‎10, p. 43]. Examining the structural elements of the category of «power» and presenting the definition of the imperative of «power» through the qualitative characteristics of such components as «hard», «soft» and «smart» power we offer to conduct a comprehensive analysis of the impact of one of the key component of the category of «power»: namely, the «energy power» on the implementation of Russia’s geopolitical objectives in the Eurasian theatre. Over the last decades Moscow European policy has been characterized by full-scale use of the energy factor as an effective instrument of power and leverage in promoting and consolidating Russia’s geopolitical interests in Eurasian continent and worldwide. The Russian Federation remains one of the largest exporters of energy in the world market. Occupying a leading position in oil production at the global scale Moscow provides more than 12% of the world oil trade. About 23% of the world natural gas reserves are located in the Russian subsoil contributing a quarter of world trade volumes of this source of energy. Russian nuclear power has a 45% share of uranium enrichment market, 15% of reprocessing nuclear fuel market, 5% of the power generation market, 15% of the nuclear reactor construction and 8% of world production of natural uranium [‎‎11, ‎12, ‎13]. Oil and gas sector has a vital importance for stability of the Russian economy, social security, sustainable development of scientific and technological projects and a number of other fields of the Russian Federation, which directly or indirectly affect the formation of the «might» of the state. Over the past decade the share of export revenues of oil and gas products in the Russian economy has been growing rapidly. Fig. 1 depicts the dynamics of energy sector revenues to Russia’s budget, where oil and gas incomes accounted over 50% of the federal budget revenues for three consecutive years (2011-2013), that corresponds to about 11% of GDP. Under such circumstances P.Schweitzer, an American researcher of energy geopolitics, is sure that the main reason of political and economic bankruptcy of the Kremlin lies in energy prices falling, primarily on oil and gas. In particular, the scholar calculated that the reduction of world oil prices to $ 10 will inevitably increase the Russia’s federal budget deficit to 1.4% of GDP [‎27, p. 239]. The evidence base for this assumption is the obvious presence of direct correlation of the Russian budget on the world oil price. Thus, Fig.2 shows dynamics of crude oil Brent prices in the energy market, since the given variety of «black gold» is basic in shaping the pricing policy for most types of world oil. 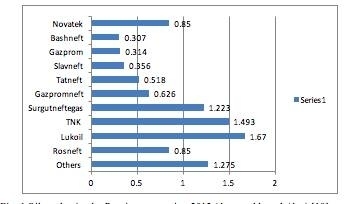 Price of Russian export oil mixture Urals is calculated with a small discount relative to Brent oil. Comparing the data of Fig.1 and Fig.2 covering the period 2003-2012 the evident growth of Russia’s energy revenues can be traced in accordance with the increase of world oil prices. At that, a noticeable fall in the average prices of the world oil market was observed in 2007 and 2009 (Fig. 2) triggered a similar reduction of energy revenues of the federal budget of Russia (Fig.1). Such a pattern, in our view, serves as sufficient evidence base for an opportunity to find a solution offered by the American scientist. Indeed, even short-term sharp decline in oil prices on the world market in early 2013 called the actual freezing of amount of budget revenues from energy resources of the Russian Federation at around 49,9%. 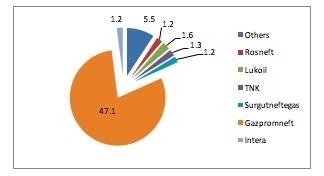 Over the last decade the energy resources confidently occupy two thirds of Russian exports (Fig. 3). However, the content of the roll metal products, chemical industry, automobile industry, agricultural products and other components including weapons and agriculture combined with Russia export balance is three times lower than the corresponding raw-power estimated figure. In case of major fall of world prices and demand for oil and gas against the current Russia’s negative trade balance in services and exports of finished products the situation could seriously affect economics and become a catalyst for political reboot of the Kremlin. According to the Institute of Energy Research, the Russian Academy of Sciences, as a result of «anti-Russian political consolidation» in the world arena Russian oil exports could fall by 25-30% thus reducing the state GDP by more than $100 billion [‎‎16]. It is not a coincidence that Russian Finance Minister A.Sulianov assessing the risks of economic security of the state in an explanatory note to federal budget for 2014-2016 focused a special attention on oil and gas budget deficit at 10.3% of GDP in 2013. In his opinion it makes the economy of Russia extremely vulnerable to external factors. Following this the statesman set the objectives to reduce the level of non-oil and gas deficit up to 8.4% by 2016, thereby to neutralize the possible threats triggered by negative trends in the world energy market [‎‎17]. As noted in the 2012 annual report of the U.S. Energy Information Administration the majority (79%) of Russia's crude oil exports went to European countries (including Eastern Europe), particularly Germany, Netherlands, and Poland. Around 18% of Russia's crude oil exports were destined for Asia and only remainder (about 3%) is exported to the Americas. (Fig. 4) [‎18]. Russia sends more than 76% of its natural gas exports to customers in Western Europe, with Germany, Turkey, Italy, France, and the United Kingdom receiving the bulk of these volumes (Energy VIP-clients). Certain volumes of natural gas owned by Gazprom are shipped to Austria, Finland, and Greece. Currently, Russia oil and gas sector remains dominated by state-owned firms. Although, it’s worth mentioning that following the collapse of the Soviet Union the Initial privatization of its oil industry has taken place, but later the energy complex has reverted to state control. In the late 1990s, a few privately-owned companies drove growth in Russia’s oil sector and a number of international oil corporations attempted to enter the Russian market. Thus, in 2003, British Petroleum (hereinafter - BP) invested in Tyumen Oil Company (hereinafter - TNC) forming a joint venture TNK-BP, one of country's major oil producers. However, in 2012 and 2013, TNK-BP partnership was dissolved, and BP had to sell its assets to «Rosnef» company. In the previous century, Rosneft emerged as Russia's top producer following the liquidation of Yukos assets, which Rosneft acquired [‎‎18]. ConocoPhillips entered Russia's oil exploration and production in the 1990s, but the attempts to increase its investments were unsuccessful. In particular, in 2004 Lukoil, the second-largest after Rosneft Oil Company in Russia signed a strategic agreement with KonokoFilips. As a result in 2010 Lukoil owned 20% of Russian assets of the said U.S. oil company. So far it is a single joint oil exploration project of American ExxonMobil company and «Rosnef» for developing the Arctic shelf and the Black Sea. (Fig. 6). Russian company «Gazprom» is a dominant player in national gas market with share of 74%, while controlling nearly 65% of proven gas reserves. In addition, «Gazprom» has legal monopoly on Russian gas exports. The fate of other companies in Russian gas market is not significant as shown in Fig. 7. 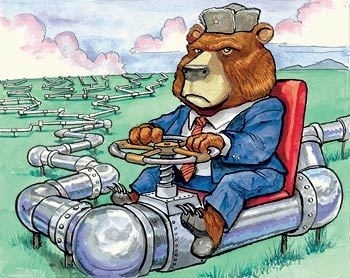 Thus, the Russian gas market is virtually monopolized by the state-owned «Gazprom» company. The conclusion from the above statistical analysis is obvious. Over the last decade Russia’s federal budget is directly dependent on the profitability of the oil and gas industry. In this sense, it is important to focus on the fact that the Russian energy sector is almost entirely monopolized by the state, while the Russia's ruling elite is, say, the top management of the energy sector. In such circumstances the country's leaders gained a wide financial support for significant flow of remittances into the national economy and biased distribution of energy resources, as well as the opportunity to direct significant resources to achieve their strategic interests at the regional and global levels. In this connection, considerable efforts are directed by the Kremlin to maintain high world prices for hydrocarbons and preserve the excessive energy dependence of actors of international relations in the field of Russian national interests. At the same time, the circumstances under which two-thirds of Russia's exports are contributed mostly by energy products have a controversial decision for the geopolitical ambitions of Russia. On the one hand, the Russian Federation positioning itself as an «energy superpower» in Eurasian continent skillfully and purposefully uses the energy power factor for forming a «club» of loyal energy-dependent European countries. This strategy allows Moscow based on energy-motivated «lobby» in critical situations to affect easily on key foreign policy decisions of the EU in a positive perspective for Russia. On the other hand, excessive dependence of national economy on energy revenues is the weakest link in geopolitical «game» of the Russian ruling elite. In case of accidental coincidence of circumstances on the world energy market, in particular the generated collapse of world oil and gas prices, a potential for instability emerges inside of Russian state. So, there is a likelihood of external destructive impact on Russia’s social and political balance. Using the power factor it is possible to provoke a strong economic collapse and crisis in the territory the Russian Federation, say, «to undermine the situation from the inside». Understanding the situation currently prevailing at the global energy market in the second part of ХХ century enabled L.Woodhill, the analyst of «Forbes» publication, in his article «It's Time To Drive Russia Bankrupt» to reach a conclusion as to direct connection between Soviet military activity and growth of world energy prices. In particular, by analyzing the dynamics of energy prices since the mid-twentieth century the author argues that » on an end-of-year basis real crude oil prices averaged $17.66/bbl from 1950 to 1972. By the time that R.Reagan took office they had almost quintupled to $85.98. It was this oil price windfall that fueled Soviet expansionism in the 1970s [‎‎23], - the scholar sums up. We consider that such position of the American scholar deserves attention of the scientific community. Because, exactly in the end of the 1970s when the hydrocarbons price reached historical maximum at that time, the Soviet Union dared to launch a military campaign (the Soviet invasion of Afghanistan in 1978 ). Besides, comparing the dynamics of prices for hydrocarbons in the 1970s and the increased activity of the USSR (Russia) in local conflicts during the selected period (Egypt (1969-1974), Syria (1973), Cambodia (1970), Bangladesh (1972 - 1973), Angola (1975-1979), Mozambique (1975-1979), Ethiopia (1977-1979), Afghanistan (1978 - 1989)), one can follow a definite dependence, which can be represented by a formula: continued growth of energy cost stimulated the aggressive Soviet foreign policy. Pursuing the research on the issue at the present stage and comparing the price development for Brent crude oil over the 1987-2013 period (Fig. 2), it is hard not to notice the coincidence in time of the invasion of the Russian Federation on the territory of Georgia (2008) with next historical maximum in raw material costs. Finally, the continuing growth in world energy prices in late 2013 - early 2014 coincided with another aggression of Russia against the Ukrainian state in the Crimea. Taking into account the Kremlin aggressive behavior in the international arena the US President B.Obama on March 28, 2014 left for a short-term visit to Saudi Arabia. The expected subject matter of international negotiations was the possibility of increasing of Er -Riyadh oil production and reducing its price to $ 80. / Bbl. The Middle East activities of the U.S. President forced Russia to «slow down» almost for month an open military intervention on the territory of Ukraine. However, powerlessness and indecisiveness of the EU in imposition of economic sanctions due to Russia’s flagrant violation of basic international principle of indivisibility of the territory of a sovereign state along with the success of Russian diplomacy in the energy negotiations in the European theater and the East (China), in early May 2014 encouraged the growth of «export of Russian mercenaries and weapons» to the eastern regions of Ukraine, navigating from the Russia-Ukraine confrontation to the so-called «hybrid war» phase. At present, the expenditures of the «National Defense» chapter of Russia’s Federal Budget are increasing both in absolute and in relative terms. As a result, their share in GDP and total expenditures of the federal budget has continued to grow. It is worth mentioning that in 2013 the growth of military expenditures of the Russian Federation took place. According to analysts T.Tischenko and S.Belev (the Ye. Gaidar Institute for Economic Policy, Russia) one-third of 2013 budget expenditures under the Law on the Federal Budget for 2013-2015 was allocated on national defense (Fig. 9 presents comparative schedules of ratio percentage of the federal budget to national defense, security and law enforcement compared to spending on education and health for 2010 – 2015). Russian experts in their study draw the following conclusions, - compared to previous year the major growth of spending falls on the «National Defense» chapter reaching 17.3% rate or 1.63 trillion rubles and 16.1% or 198.3 billion rubles fall on the «Applied field of national defense» chapter. This totals of approximately one-third of all expenditures of the federal budget [‎‎19]. If 2012 military spending of Russia accounted for 3% of GDP this figure according to the Federal budget in 2015 would reach the level of 3.7%. However, the current rapid dynamics of growth of real federal spending on defense complex can be assessed with the help of the Federal Treasury report regarding the implementing of the main financial document of the state in January 2014. According to the report the budgetary costs of national defense increased by 18% compared to the same period in 2013. In the opinion of the head of the military economy laboratory of Gaidar Institute V.Zatsepin if recent trend continues in 2014 the military burden on Russian economy could reach 5% of GDP [‎‎20]. By this indicator Russia will be able to surpass the United States, which directly or indirectly spend about 4.4% of GDP on defense each year. However, speaking in absolute terms the Russian Federation spends on military sector approximately 10 times less than the U.S. (it’s about $70 billion compared to %740 billion a year). Having analyzed the official documents the experts of the Gaidar Institute came to a conclusion that the share of secret expenditures of the federal budget has been constantly growing. Over the last 10 years this share had risen almost one and a half times: from 11.3% in 2005 till and 16.7% in 2014. In other words, within funding key sectors of economics considerable sums of the budget are steadily growing in respect of which no purpose is specified. In official documents these needs have not been formulated and the authorities which should account for their use were not specified. In general, it is about 2.3 trillion rubles while two-thirds of this amount fall on defense contracts and the remainder is distributed to financing special services. According to the Russian expert V.Zatsepin the share of secret expenditures of the federal budget can make up 25% in 2016 . In addition, the Russia’s Ministry of Finance stated that in 2016 spending of the « National Defense» chapter of the federal budget will grow by 63% compared to 2013 and amount to 3.418 trillion rubles. [‎‎21]. Growing military expenditures is of particular concern of European politicians. In particular, NATO Secretary General A.Rassmusen pointed out that over the past five years Russia’s military budget increased by 10%, while defense expenditures in Eastern and Central European countries reduced by 20% [‎‎26]. However, Western experts rightly believe that income received from Russia’s trade in energy resources is one of the main sources of finance and basic precondition to hold onto the current authoritarianism in the Kremlin. At the same time, L.Aron, a scholar at the American Enterprise Institute in his article «The Political Economy of Russian Oil and Gas» contends that petrodollars, the Federal Security Service and television are important tools for survival of the Putin regime [‎‎24]. Following the results of our empirical studies (Fig. 1, 8, 9) comparing the government budget revenues from trade of energy resources and federal spending of the Russian Federation in the third millennium it becomes evident that the state gives priority to use profits from the energy sector for re-equipping the defense industry, military modernization and strengthening security sector. At the same time the Russian government «in the lean mode» provides funding for education and science, medicine and culture, social security and so on. Moreover, in recent years there is a clear imbalance in the federal budget between governments spending on defense sector and «power block» and investment in human capital with considerable preferences in favor of the former. The situation described above as expected is a matter of concern of experts and scientific community about high probability to use a powerful military potential by Russia as a tool for implementation of aggressive foreign policy and an effective method to express its ambitious plans of world leadership and consolidate geostrategic dominance of Russia in the Eurasian theater. The current behavior of Russia in relationship with Ukraine confirms the validity of this concern. After a brutal violation of international law and annexation of Ukraine’s Crimea there have been frequent calls among influential representatives of the world's political elite to urge the European Union to impose tough anti-Russian financial economic sanctions. United States of America, Canada, Australia, Japan and many other countries join in expressing their understanding of the need for consolidation efforts of international community against aggressive policy of the Kremlin. In particular, official Washington conducted numerous consultations with the leading EU countries and at the EU institutions about joint economic restrictions against the Kremlin. Meanwhile, Hillary Clinton, former Secretary of State of the Obama administration defined low level of diversification in the modern Russian economy and openly acknowledged the sanctions in the energy sector as the most appropriate powerful lever of pressure on Russia [‎‎30]. However, in this sense, there are some concerns and warnings among European countries and the influential EU officials. After all, according the disappointing forecasts that in case of sanctions on the Russian oil export bans the EU economy will require additionally about 6 million barrels of oil daily. This change in the global market will further trigger a significant jump in energy products prices. A rapid growth in demand for hydrocarbons in Europe will partially refocus the oil field of state-exporters of the Persian Gulf and West Africa from Asian to European market. In turn, vacant market segment in Asia over time with a significant likelihood can be covered by Russia (by the way, some efforts to this end the Kremlin has made concluding a contract for gas supply to China in May 2014). However, the sharp rise in oil prices in Europe would inevitably cause the rise of gas price because according to «Gasprom» contract it has been calculated using a certain formula that correlates with the oil price. Such a development of the situation in future will trigger the so-called «domino effect»: the rising cost of logistics services, increase of light and food industries products, as well as the fuel price hike for services where a fuel-energy component is present. Over time, the combined effects of failure of the European economy from Russian oil in the circumstances of absence of sufficient technical capacity, waste logistic plans and predetermined sources of replacement and alternative supply of raw material would involve the EU into a new round of recession. Traditionally, the objectives of sanctions are to create serious economic difficulties to governments on order to influence their destructive internal or aggressive foreign policy. However, in modern conditions the immediate imposing of oil sanctions towards Russia will have a temporary effect and limited consequences that significantly differs from the expected result. Instead, it will provoke substantial economic complications and tangible financial losses of the European Union states. Whereas, with time the Russian Federation succeeds to diversify the oil market through the Asian export destination it would gradually resume revenues from the sale of petroleum products and even will be able in the future to increase the profitability of energy business due to the increase of gas price. This is the similar opinion of opponents of the EU group of «pro-Russian anty-sceptics» regarding imposing sectoral sanctions in Russia’s energy sector. This is clear that urgent imposing of oil sanctions without painstaking preparatory phase, proper scientific expert estimate and strong support of international community seems unlikely and is not effective. In the near future the EU states will be unable to reach a consensus on the matter and find understanding and support of key consumers of Asian energy market, especially China. Thus, for today the imposing of sectoral sanctions by the European community in energy sector is likely to become the issue of political rhetoric and an instrument of psychological pressure rather than a real tool of immediate effective impact on Russia. Although, the initiatives and persistent efforts of Great Britain and Poland regarding restrictions on Russia’s energy sector have been embodied in the decision of the European Union on imposing partial sanctions in the selected sector of economy. The reason of London strict position on this issue was announced by Simon Smith, the British Ambassador to Ukraine, who considers that the de-escalation of the conflict in Eastern Ukraine is the main goal of imposing the EU sanctions. In particular, the head of the Embassy said they did not notice any affirmative action from Russia, clearly requested before, for de-escalation of the situation. He added Russia on the contrary was making efforts to destabilize situation in Ukraine [‎‎39]. In our view, President B. Obama gave the most full and inclusive description of the current situation on imposing sanctions against Russia in his statement on July 25, 2014. The President noted Russia’s and European economies have gotten themselves intermeshed (intertwined) especially in the energy sector. Due to this, certain states are most concerned about determined response concerning violation of Ukraine’s sovereignty and territorial indivisibility by Russia. Also, the President shared the news that despite some commercial interests Europe supported the US in imposing sanctions on Russia. Not always as quick as one would like, but supported [‎‎37]. Putin’s team is well aware of the likelihood of significant financial losses for the economies of countries that dare to apply restrictive measures against Russia in energy sector and does expect a certain pragmatism and rational approach in conduct inherent to Europeans. After imposing of the US economic sanctions against Moscow the Russian President in his speech focused on financial and economic losses that the American economy will incur losses together with the Russian economy [‎‎35]. Thus, justifying foreign policy failures of the Russian leadership some members of Russia’s industrial community rushed to accuse the US in their efforts to worsen the living standards of ordinary Russians through economic tools of pressure. In such a way, that it could trigger social turmoil and discontent with the state’s leadership. So, I.Sechin, Chairman of state energy company «Rosneft» in a press conference regarding the Washington sanctions on his budget forming company openly called such a move of the White House as a desire to worsen wellbeing of the Russian population and undermine confidence of people to the leadership of the state [‎‎36]. However, after having become convinced of the documented information in guiding the lion share of budget oil revenues to defense spending, one can easily see a speculation and recognize the lack of truth in the words of the official. Obviously, the objective of imposing economic sanctions including the energy sector is the desire of the world community to calm the excessive militaristic ambitions and aggressive policy of the Kremlin. In support of the view of this situation it was mindful to quote the words of Geoffrey Pyatt, U.S. Ambassador to Ukraine, who said they didn’t put sanctions for the sake of sanctions to destroy the Russian economy. In his opinion, it could push the Kremlin to make strategic policy solutions and initiate communication with President Poroshenko [‎‎38]. However, based on the words of the head of the Russian energy company, the government is ready to cut the social programs that had been already funded in a restricted mode rather than to end the obsession of creation of the most powerful army in the world even in the absence of a real military threat. Also, encouraging is the fact that general public will understand the inevitability and objective need for introduction of tough economic constraints in case of Moscow’s extended territorial aspirations in Eastern Europe. Evidence of expected response of the international community to aggressive actions of the Kremlin is confirmed by a statement of Ukrainian Prime Minister A.Yatsenyuk declared on the meeting of the Government. Prime Minister commented on the imposition of economic sanctions on Russia by Washington: «all attempts of the Kremlin to split the European Union, to prevent joint actions the EU and the United States are doomed to failure. It's time to pay for violations of international law, military aggression, for a constant supply of weapons to Ukraine by Russia, financing of bandits who kill innocent people and try to destroy Ukraine. Russia will pay for the war unleashed against Ukraine» [‎‎32]. The majority of European countries are aware that there are no alternative and inevitability for tough effective measures of response. During the meeting of the EU foreign affairs ministers (2014) the possibility of imposing a wide range of economic restrictions for calming down the military ardor of the Kremlin has been discussed. R. Sikorski, the head of the diplomatic office of Poland, publicly advocated in favor of imposing sectoral sanctions on the Russian energy sector in response to war unleashed in Ukraine. However, unfortunately the EU has not reached the consensus regarding the scope and content of restrictions, although encouraging is a recent statement of German Chancellor Angela Merkel concerning the desirability of imposing significant sanctions against Russia [‎‎‎33]. However, the statement of German foreign minister F.Steinmeier released in Poland on the inappropriateness of immediate measures in the energy sector will significantly narrow the negotiation space with Russia. This move predicts long and difficult negotiations in search of a reasonable compromise and development of an agreed action plan for European countries [‎‎31]. Position of the EU Energy Commissioner Günther Oettinger who spoke strongly «against sanctions in oil and gas sector» not excluding the desirability of making significant economic restrictions in other fields [‎‎34] is a direct confirmation of our assumption. However, the current situation on the political horizon is completely extraordinary and changes so rapidly that it is unlikely to foresee the development of events. In addition, the «game» in the energy field is developing so rapidly and unpredictably that some data and some information become obsolete and lose relevance in the processing requiring reworking of topics and data accessible in near-real time. Obviously, external goals of the energy policy of Russia on the European space at the present stage can be concentrated on achieving geopolitical goals, as well as the promotion of national interests in the energy sector. If 20 years ago Russia was trying to influence European the state through ideological factor, now Russian Federation shows a new vision of its foreign policy, actively using the energy trump card in the great political the game. So, with the view of creating an effective system of deterrence of the Kremlin aggressive energy policy in the European vector it is necessary to use a full scale of measures as a means of political and economic pressure on Russian Federation in non-energy field but directly focused on the Russian energy sector. The list of the mentioned tools of financial and investment impact includes the following: restricting access to the global financial markets, such as limitation or terminating lending by Western banks or a ban on placement of shares issued by Russian enterprises in world exchanges; refusal of Western companies to invest in Russia's fuel and energy complex, including direct investment in enterprises of different industries and the Russian stock market; implementation of trade sanctions and embargo on technical equipment, suspension of providing services by foreign companies in Russia’s oil exploration, production and extracting and logistics industries and so on. These measures will have tangible negative consequences for economy such as rising cost of loans for Russian companies, increased capital outflows, depreciation of national currency and emigration of skilled professionals in oil and gas sectors abroad. In fact, financial and investment insulation, the capital outflow and exodus of intellectual and technical elite also bears a higher risk to the economy and national security of Russia in the long term. Thus, the impact non-power tools of financial and economic pressure on the energy sector within the collective countering to aggressive manifestations and consolidated opposition to Russia's imperial ambitions may be the most acceptable and economically affordable tool through direct restrictive measures in the energy sector for European community in the future. This can happen under the circumstances of the lack of diversification of European energy market and limited access to alternative energy supplies for the EU states. At the same time, there is some concern about the EU inability to overcome interstate contradictions and inconsistencies regarding the application of powerful energy sanctions against Russia and some skeptics’ disappointing forecasts of deepening discord in the camp of the EU states over implementation of sectoral limitations in the energy sector. Despite of this, the shared understanding of geopolitical expediency prevailed over reluctance of some countries to experience economic losses and the desire to preserve the existing preferences and advantages among other members of the European community in energy relations with Russia. However, to avoid a probability of such dramatic scenarios for future development the EU states should examine the feasibility of establishing a reserve anti-crises European fund in the near future and to count an algorithm of accrual and compensation of possible losses of national economies and minimize financial risks of the EU member states because of the economic sanctions. In particular, the EU states urgently need to develop and implement a mechanism of adequate allocation of economic and financial responsibility for adopting restrictions in the energy sector. In case, the sanctions have been imposed total losses incurred by the EU should also be counted. At this, the potential asymmetrical steps of Russia in response to energy restrictions (in this case, Russia’s sanctions on Polish fruits and vegetables) should be taken into account. Thus, the compensation of the losses within the EU joint responsibility for unpopular economic decisions should be proportional to all countries of the European community, for example, depending on the size of GDP and so on. European politicians should draw disappointing lessons from unfortunate present realities and, above all, to revise too cumbersome and highly formalized decision-making procedure of the EU in security field which is having an adverse impact on the situation and makes it difficult to respond quickly and appropriately to challenges of modern world of developed communication and «online solutions». However, in the present circumstances of tense situation in the European theater despite the possible financial losses and economic hardship for the population and the EU economy, sectoral sanctions in the energy sector may be almost the only real effective instrument against aggressive acts of the Russian Federation in the east of European regions. Persistent reluctance of the European community to bear the economic losses and experience restrictions for prompting the Kremlin to return to the international legal framework, in future might have disappointing political consequences, deepening of crisis in the system of international security and further destabilization of the situation in the European space. Thus, in case of further escalation of events on the eastern borders of Europe and an increase of aggressive rhetoric of the Russian Federation the economic sanctions have to become a justified price, which will be paid by the EU states and their people for the sake of peace and security in the short term. Finally, in the long term, Europe should not reject the progressive, controlled and predictable decline of oil prices in the world market as a factor of effective impact on militarized economy of the Kremlin. Based on our review, the research concluded that the Russian economy is particularly sensitive to the international fluctuations in the oil and gas prices. In particular, the price formation process on Russian exported energy is directly tied to the crude oil Brent price in the world market, which in turn directly affects the size of the federal budget revenue which by two-thirds consists of the proceeds from oil and gas sale. So, mathematically calculated economic benefit gained in case of falling of crude oil Brent prices to $ 80/barrel assuming completion of a situation of one year will pose an inevitable stagnation and decline of the Russian economy [‎‎29]. Of course, similar trend will be accompanied by growth of critical negative effects in all areas of social and political life of the country. However, rapid uncontrolled fall of energy prices will lead to expected disbalance of the global economy. Together with the destabilization of the socio-economic and political situation in Russia, which owns one of the largest nuclear arsenals, it will cause the unpredictable negative consequences on the global scale and will be considered extreme for Europe. Overall, a sharp fall of oil prices can also directly harm the economic interests of the United States. In this situation the US shale oil and gas profitability projects considered as probable sources of energy diversification in European market will lose economic sense. However, the gradual decline in world oil prices is quite acceptable for the US economy. Analysts predict that perspectives of this scenario appear an objective reality that will become the root cause of a protracted global financial crisis and decline in industrial production including rapid scientific and technological progress which can offer alternative energies [‎‎22]. Thereby, continued but then notable decrease in energy prices would permit Europe to stimulate its own economy, at the same time having pacified with the help of relatively painless economic instruments the Kremlin aggressive militaristic ambitions where the lion's share of revenues from trade of energy resources goes to military spending. Thus, a moderate decline in oil prices would be of benefit to Europe and the US and would play in favor of strengthening geopolitical stability and geo-strategic balance in the world. However, systemic implementation of the outlined scenario of events on energy market will require coordinated actions of global players together with energy producing states whose economic interests in conflict with significant fall in oil prices. Thereby, the United States and a united Europe should present to the Persian Gulf states (especially Saudi Arabia) and other members of «club of energy states» the acceptable alternative compensation mechanism of possible losses, offering the replacement performance of reduce of oil price to corresponding proportional increase in oil production, thus leveling negative impact on export-oriented «energy economy» of the Middle East states. Also, one of the most important tasks of the EU strategic course directed at deprivation of negative effect of the energy factor on monolithic position and alignment of the euro zone economies in the near future could be the creation of a single European energy market. In particular, a balanced diversification of energy supply in Europe will become an effective way of limiting Russia’s excessive impact on the economy and politics of the European Union. However, problematic issues highlighted above are more related to security sector of the EU-Russia interaction. But, study of mechanisms for the implementation of depicted scenario of development in the global energy market should be the issue of separate substantive research and goes beyond the scope of our publication. 2. Dahl R. The Concept of Power // Behavioral Science. – 1957, II July. 4. Morgenthau H. Politics among nations: the strugglefor power and peace . Brief ed. –N.Y., 1993. -419 p.
5. Stossinger J. The might of nations. World politics in our time. –N.Y., 1963. -475 p.
6. Russel B. Power. A new social analysis. – London, 1938. -328 p.
7. Cline R. World Power Trends / Cline, Ray S. Scalapino, Robert A. Simes, Dimitri K. & Wells, Samuel F. eds. Main Trends in World Power: Political Impact of Strategic Weapons. [Washington]: The Center for Strategic and International Studies, Georgetown University, 1978. –Р. 1−29. 9. Nye J. Soft Power: The Means to Success in World Politics. / Nye J. –New York: Public Affairs Group, 2005. – 191 p.
10. Nye J. S., Jn. The Powers to Lead / J. S. Nye, Jn. – Oxford: University press. – 2008. – 226 p.
11. Петров В.В. Долгосрочные перспективы российской нефти / Петров В.В., Поляков Г.А., Полякова Т.В., Сергеев В.М. – М.: Фазис, 2010. – 213 с. 12. Накиценович Н. Мировые перспективы природного газа / Накиценович Н. – М.: РХД, 2011. – 189 с. 13. Годин Ю. Россия: экономика, политика. Геополитическая роль внешней торговли энергоресурсами для России / Ю. Годин // Мировая Экономика и Международные Отношения. – 2011, №2. – С. 103-109. 14. Илларионов А. Нефтегазовые доходы превысили половину всех доходов федерального бюджета [Електронний ресурс] / А. Илларионов // Особистий блог А. Ілларіонова. – Режим доступу: http://aillarionov.livejournal.com/452863.html. 15. Наганов В. Нефть в обмен на удовольствие [Електронний ресурс] / В. Наганов // Особистий блог В. Наганова. – Режим доступу: http://naganoff.livejournal.com/97670.html. 16. Oil & Natural Gas Sector in Russia: Fueling Growth [Електронний ресурс] // Thomas White International. – Режим доступу: http://www.thomaswhite.com/global-perspectives/oil-natural-gas-sector-in-russia-fueling-growth/. 17. Gold R. U.S. Is Overtaking Russia as Largest Oil-and-Gas Producer [Електронний ресурс] / Gold R., Gilbert D. // The Wall Street Journal – Режим доступу: http://online.wsj.com/news/articles/SB10001424052702303492504579111360245276476?mg=reno64-wsj&url=http%3A%2F%2Fonline.wsj.com%2Farticle%2FSB10001424052702303492504579111360245276476.html. 18. Overview [Електронний ресурс] // U.S. Energy Information Administration. – Режим доступу: http://www.eia.gov/countries/cab.cfm?fips=RS. 19. Тищенко Т., Белев С. Федеральный бюджет: равнение на оборону // http://ecpol.ru/macroeconomics/2012-04-05-13-38-34/800-federalnyj-byudzhet-ravnenie-na-oboronu.html. 20. Зацепин В. Россия обгоняет США по доле оборонных расходов [Електронний ресурс] / В. Зацепин // Інститут економічної політики імені А.Т. Гайдара. – Режим доступу: http://www.iep.ru/publikatcii/showbib/6691.html. 21. Минфин согласился нарастить расходы на национальную оборону на 63% [Електронний ресурс] // Погляд. Ділова газета. – Режим доступу: http://vz.ru/news/2013/7/2/639680.html. 22. BP Energy Outlook 2035. [Електронний ресурс] // BP Energy Outlook. – Режим доступу: http://www.bp.com/content/dam/bp/pdf/Energy-economics/Energy-Outlook/Energy_Outlook_2035_booklet.pdf..
23. Woodhill L. It's Time To Drive Russia Bankrupt Again [Електронний ресурс] / Woodhill L. // Forbes. – Режим доступу: http://www.forbes.com/sites/louiswoodhill/2014/03/03/its-time-to-drive-russia-bankrupt-again/. 24. Aron L. The political economy of Russian oil and gas [Електронний ресурс] / Aron L. // U.S. Energy Information Administration. – Режим доступу: http://www.aei.org/article/the-political-economy-of-russian-oil-and-gas/. 25. Perlo-Freeman S. Trends in world military expenditure, 2013 [Електронний ресурс] / Perlo-Freeman S., Solmirano C. // Stockholm International Peace Research Institute. – Режим доступу: http://books.sipri.org/product_info?c_product_id=476. 26. Генсек НАТО: Скорочення витрат на оборону в Європі не має виправдання [Електронний ресурс] // Еспрессо.ТВ. – Режим доступу: http://espreso.tv/news/2014/05/15/hensek_nato_skorochennya_vytrat_na_oboronu_v_yevropi_ne_maye_vypravdannya. 27. Schweizer P. Reigan’s War. The Epic Story of His Forty-Year Struggle and Final Triumph Over Communism. / Schweizer P. – N.Y.: Random House. Doubleday, 2003. – 352 p.
28. Brent spot monthly [Електронний ресурс] // Вікіпедія. – Режим доступу: http://en.wikipedia.org/wiki/File:Brent_Spot_monthly.svg. 29. Партнерство между США и Россией. Новые времена. Новые начинания / Под ред. Курта Уэлдлона; пер. на рус. American Foreign Policy Council. – Washington, D.C.: Franklin's Printing Company, 2003. – 78 с. 30. MH17 tragedy: Hillary Clinton calls for tougher sanctions on Russia [Електронний ресурс] // Firstpost. – Режим доступу: http://www.firstpost.com/world/mh17-tragedy-hillary-clinton-calls-tougher-sanctions-russia-1628763.html. 31. Сікорський і Штайнмайєр розповіли про подальші санкції проти Росії [Електронний ресурс] // УкрІнформ. – Режим доступу: http://www.ukrinform.ua/ukr/news/sikorskiy_i_shtaynmaye_r_rozpovili_pro_podalshi_sanktsiii_proti_rosiii_1957752. 32. Яценюк: рішення США та ЄС про запровадження санкцій проти РФ продемонстрували відданість цінностям демократії [Електронний ресурс] // Сайт новин. – Режим доступу: http://www.newsru.ua/ukraine/17jul2014/jazenuk.html. 33. Меркель підтримала негайні санкції проти Росії [Електронний ресурс] // Електронне видання IPress.ua. – Режим доступу: http://ipress.ua/news/merkel_pidtrymala_negayni_sanktsii_proty_rosii_76208.html. 34. Санкції проти енергетичного сектору РФ будуть у кінці списку ЄС, – Еттінгер [Електронний ресурс] // Електронне видання IPress.ua. – Режим доступу: http://ipress.ua/news/sanktsii_proty_energetychnogo_sektoru_rf_budut_u_kintsi_spysku_yes__ettinger_70509.html. 35. Путин: Американские санкции заводят отношения в тупик [Електронний ресурс] // Press.TV. – Режим доступу: http://russian.rt.com/inotv/2014-07-17/Putin-Amerikanskie-sankcii-zavodyat-otnosheniya. 36. Сечин: санкции против «Роснефти» незаконны и необоснованны [Електронний ресурс] // Ітар-Тасс. – Режим доступу: http://itar-tass.com/ekonomika/1322902. 37. Європа підтримала США в питанні санкцій щодо Росії [Електронний ресурс] // Телевізійна служба новин. – Режим доступу: http://tsn.ua/svit/yevropa-pidtrimala-ssha-v-pitanni-sankciy-schodo-rosiyi-obama-360668.html. 38. Д.Пайєтт розповів, коли США введуть наступні санкції проти РФ [Електронний ресурс] // Українські національні новини. – Режим доступу: http://www.unn.com.ua/uk/news/1369261-d-payyett-rozpoviv-koli-ssha-vvedut-nastupni-sanktsiyi-proti-rf. 39. Британия будет поддерживать решительные санкции против РФ — посол [Електронний ресурс] // Канал ICTV. – Режим доступу: http://facty.info/britaniya-budet-podderzhivat-reshitelnye-sankcii-protiv-rf-posol/.